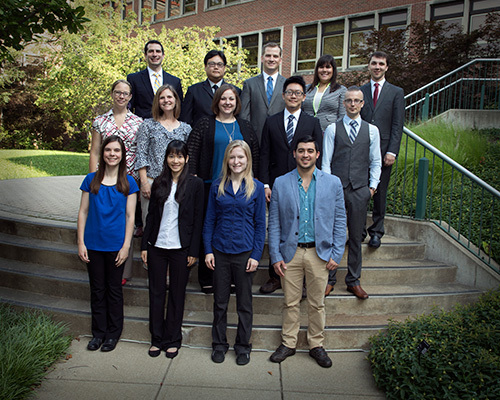 New Purdue Veterinary Medicine residents and intern in the Departments of Veterinary Clinical Sciences and Comparative Pathobiology: (Front Row, left–right) Elena Rodriguez, Sissy Hong, Natalia Strandberg (Clinical Pathology), and Javier Martínez López (intern with the Centaur Equine Specialty Hospital in Shelbyville, Ind. ); (Middle Row) Rebecca Zaremba, Marejka Shaevitz, Lynn Little, Dah–Renn Fu, and Garrett Oetelaar; (Top Row) Kenneth Brand, Li–Jen Chang, Jase Skelton, Kaitlin Mielnicki, and David Worth. Dr. Kenneth Brand (Small Animal Surgery) earned his DVM degree in 2015 at the Cornell University College of Veterinary Medicine and completed an internship with Gulf Coast Veterinary Specialists in Houston, Texas this year. Dr. Li–Jen Chang (Anesthesiology) comes to Purdue from the Animal Medical Center at the Taipei Zoo in Taiwan where he worked as a veterinarian. He earned his DVM degree in 2003 and his Masters of Veterinary Medicine in 2005 at National Chung Hsing University in Taichung, Taiwan. Dr. Dah–Renn (Darren) Fu (Radiation Oncology) earned his Masters of Veterinary Medicine at National Chung Hsing University in Taichung, Taiwan in 2006. He then earned his PhD in veterinary science at Rakuno Gakuen University in Hokkaido, Japan in 2015. Dr. (Hsuan–Ping) Sissy Hong (Neurology) earned her DVM degree in 2012 at the National Taiwan University School of Veterinary Medicine in Taipei, Taiwan, and then completed an internship at the Atlantic Veterinary College, University of Prince Edward Island in Charlottetown, Canada. Dr. Lynn Little (Small Animal Medicine) earned her DVM degree in 2011 at The Ohio State University College of Veterinary Medicine and completed an internship at the Veterinary Medical Centre, Western College of Veterinary Medicine in Saskatoon, Canada. Dr. Javier Martínez López (Centaur Equine Specialty Hospital intern) earned his DVM degree in 2013 at the Universidad de Guadalajara in Guadalajara, Mexico, and then worked as an associate veterinarian at Eqcovet in Guadalajara before taking a position as an intern in 2016 at the Chino Valley Equine Hospital in Chino Hills, Calif.
Dr. Kaitlin Mielnicki (Large Animal Medicine) earned her DVM degree in 2016 at The Ohio State University College of Veterinary Medicine and then completed an internship at the Piper Equine Hospital at the University of Minnesota. Dr. Garrett Oetelaar (Diagnostic Imaging) earned his DVM degree in 2016 at the Western College of Veterinary Medicine in Saskatoon, Canada, and completed an internship at the CARE Centre Animal Hospital in Calgary, Canada. Dr. Elena Rodriguez (Ophthalmology) earned her DVM degree in 2015 at the University of Missouri College of Veterinary Medicine and completed an internship at Long Island Veterinary Specialists in Plainview, New York this year. Dr. Marejka Shaevitz (Oncology) earned her DVM degree in 2016 at the Oregon State University College of Veterinary Medicine and then completed an internship at the University of Illinois College of Veterinary Medicine. Dr. Jase Skelton (Large Animal Surgery) earned his DVM degree in 2016 at the University of Calgary Faculty of Veterinary Medicine in Calgary, Canada, and then completed an internship at the Pioneer Equine Hospital in Oakdale, Calif.
Dr. David Worth (Small Animal Surgery) earned his DVM degree in 2015 at the Texas A&M University College of Veterinary Medicine and then completed an internship at the Dallas Veterinary Surgical Center in Dallas, Texas this year. Dr. Rebecca Zaremba (Emergency Critical Care) earned her DVM degree at the Ross University School of Veterinary Medicine, completing her clinical year in 2016 at the Purdue University College of Veterinary Medicine before doing an internship with the MedVet Medical and Cancer Center for Pets. Dr. Natalia Strandberg (Clinical Pathology) earned her DVM degree in 2014 at the University of Wisconsin School of Veterinary Medicine and then gained clinical experience in small animal medicine before completing a diagnostic medicine internship at the Kansas State University Veterinary Diagnostic Laboratory this year.